Is Ravens’ Terrell Suggs out for the season? NFL veteran Terrell Suggs, one of the most feared weapons of the Baltimore Ravens’ defense, had surgery Tuesday for a torn Achilles tendon, sidelining him until October 2012. This is bad news for the Ravens, one of the most awesome defensive squads of late. Suggs, who strikes fear into every opposing Quarterback (6’3″, 265 pounds, all muscle-think “locomotive”), is a major asset to the team. With 14 sacks last season, seventy tackles, seven forced fumbles and two interceptions, do I need to say his presence will be missed? Where is the Achilles Tendon? The Achilles tendon is one of the longest tendons in your body. It connects your heel to your calf muscles and allows you to extend your foot and do things like point your toes toward the floor and rise up on your toes. It’s essential for jumping, sprinting and climbing. 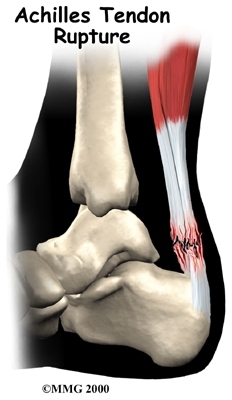 How does an Achilles tendon get torn? There are many ways to injure your Achilles tendon. It’s usually due to a very sudden, forceful start or stretch, when your leg muscles tense beyond the straining point. In Suggs case, it may have been due to a sudden twist or turn during running, too much force during weight training, or if it happened during that basketball game, a jump shot. What is the treatment for a torn Achilles tendon? For a partial tear, I always recommend a certain amount of immobilization, rest and treatment with non steroidal, anti inflammatory medication like Advil or Aleve or prescription strength if needed. I would also recommend swithcing to another sport temporarily like swimming, which is excellent for strengthening the leg muscles, but offers little chance of re-injuring the area. I might also recommend custom orthotics, or a boot to immobilize the foot. And of course physical therapy. If the Achilles tendon has a complete tear, unfortunately the only way to correct that is with surgery, which means all of the above and a considerably longer rehab time. How do you prevent damage to your Achilles tendon? As with many things foot and ankle related, proper stretching before a workout, run, or game is vital, especially as we get older. All of the tendons in our body start to degenerate with age, leaving them more prone to injury. Warming up before exercise is essential after our mid-30’s. Warm up exercises might include starting a walk slowly and gradually speeding up, slow cross court movements before tennis, brisk walking before jogging, etc. During your warm up, pay attention to the calf muscles – they are feeding the Achilles tendon. After your game or match, spend a few minutes stretching your legs to cool down and keep blood flowing to the muscles. It’s also important to always wear the right shoes during your workout or game. Athletic shoes with poor support are an injury waiting to happen. If you experience pain just above the heel, you may have damaged your Achilles tendon. Get off your feet immediately, elevate, ice and rest it and call PA Foot and Ankle Associates right away for a complete diagnosis. Staying on your feet and continuing to play increases the likelihood that you’ll take your injury from minor to major in a matter of a few minutes. ← My child has heel pain!